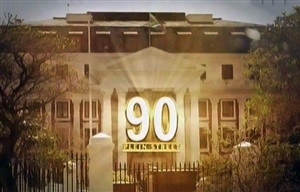 90 Plein Street is a South African television drama series created by Mandla Sibeko and Kenneth Kaplan and produced by Born Free Media for SABC Education, which follows the personal and political intrigues around Dineo Nkgatho, an ANC MP trying to balance her private life, the demands of a broken family and her party loyalty. 90 Plein Street that creates a fine weave between a family's personal life and their political playground. At the centre of the drama is Dineo Nkgatho, a long-serving MP who fought during the struggle, went into exile, and returned in 1992 on the eve of South Africa's new democracy. Through Dineo we enter the world of parliament (which is located at 90 Plein Street in Cape Town), with all of its intrigues and debates, and witness the work of the portfolio committee on health. The world of the stories is set around the core work of parliamentarians whose core functions involved government oversight, public representation and bill creation. While the show reflects the world of Parliament, it is not only about the logistics of governance. It is also about seeing democracy in action at a social level: winning and losing; personal victory and obsession; the pursuit of power, the hope for a better life, and the meaning of success in her constituency. Dineo, her ex-husband Zweli Motaung (African National Congress Chief Whip) and their children Oratile and Itumeleng become our guides to the murky and passionate world of parliament. Through them we experience the clash between the obsession for power and the unremitting struggle for a better life for all. Dineo, an independent minded MP for the majority party, struggles to reconcile her own idealism and sense of justice with the requirement of the parliamentary system while struggling to find a balance in her personal life and deal with her family responsibilities. The journey starts with Dineo's life in disarray following her divorce from Zweli Motaung, the Parliamentary Chief Whip of the majority African National Congress (ANC). The breakdown of her marriage has split her family. Her daughter, Itumeleng, lives with Naledi, Dineo's mother, in their constituency home. Dineo's son Oratile, an architectural student, lives with her in Cape Town. Zweli feels like an outsider with his own kids and resents their close relationship. A major piece of legislation, the Social Health Insurance Bill (SHI Bill) is delaying the government's order of business. Pressure on the Health & Social Welfare Committee to finalise the Committee's report on the Bill causes conflict between Dineo and the Party as she believes further public hearings are needed. A run in with Zweli turns personal and Dineo is disciplined on Zweli's orders. She takes a leave of absence in her constituency of Parys, but it is clear her standing in the Party is weakened over her personal conflict with Zweli. Disillusioned, Dineo tries to avoid engaging the concerns of her constituency. Inspired by her daughter's idealism over her school representative council elections, Dineo is drawn back to her community's needs and the service delivery problems at the local township clinic. Back in Parliament she throws herself into her work, championing her party position and contesting the political ground with Christo Beukes, an MP for the Opposition Party. Through hard work and compromise she wins back her party standing and proves her loyalty. But Dineo's life is complicated by the attentions of Sean Matthews, a parliamentary journalist, who is having a secret affair with Zweli's political advisor, Suraya Samuels. Suraya becomes a potential threat to Dineo's ambitions. Oratile is arrested for drunken driving as there is a potential conflict of interest over Zweli's parliamentary position and his business interests. To protect his son, he intervenes in the police investigation and bribes Radebe, a cop, who makes the evidence disappear. Zweli seemingly does the right thing by defusing the potential conflict over his business holdings and transfers the shares he has in company that has benefited from a government contract. However, Sean digs up evidence that Zweli may have done too little, too late. Zweli manages to survive the political fallout by donating some of his profits to charity, effectively spinning the situation to his advantage. As the stress levels mount under the Committee's workload, Dineo has a health scare and ends up in public hospital back in her constituency. The conditions are appalling but she refuses to be moved to private care. Realising she must change her life style or face grave consequences for her health, Dineo tries to cut back on the strain she is living under and agrees to go along with Zweli's suggestion that Oratile move in with him. To win Oratile's affection Zweli gives him the police blood sample. Oratile keeps the blood vial as a reminder of his father's loyalty and love. Dineo wants her political party to remain faithful to its revolutionary role, and her uncompromising attitude puts her head-to-head against the party bigwigs, often to the detriment of her family. Through Dineo we come to realise that, as with both politics and kin, it is what you do that matters more than your ideals. Zweli is driven by ambition. He did not join the struggle to be poor, and he believes he is entitled to a reward for his years of struggle and sacrifice. Seemingly strong on the outside, emotionally he is still a child. Oratile, their son, wants the easy life with its big car, fat salary and hot women. But more than that, he aches for his father's respect and approval. Oratile's brush with the law puts Zweli in a very compromising position, but will the love for his son cast his career into turmoil? Itumeleng, their daughter, dreams of being like her mother. Pre-occupied with fashion, the young girl is irritated by her grandmother's traditional values. The last thing she wants is a rural life of misery and poverty. Throughout the series, supporting characters add richness to the unfolding drama. Christo Beukes is the white Afrikaner MP whose chief concerns are crime, corruption and the protection of his privileged lifestyle. Sean Matthews, parliamentary journalist, jokes about being the coloured jam stuck between two slice of mismatched bread, one white and one dark. But his joviality hides a deep resentment. Suraya Samuels, Zweli's spin-doctor and political analyst, is a control freak. Men, to her, are disposable, even through she hates the fact that Sean has shifted his attention to Dineo. Ruth Mandel, Chair of the Portfolio Committee on Health and Social Welfare, is the party battle-axe, a long-standing stalwart who may never realise her dream of a Cabinet position. Dineo Nkgatho stands at the core of this world, and through her we come to see what the life of a parliamentarian involves once appointed to office. 90 Plein Street is produced for SABC Education by Born Free Media for broadcast on SABC2. After the first season James Ngcobo left the show and was replaced in the role of Zweli Motaung by Mpho Joseph Molepo for the second season. Other Season 1 regulars not to reprise their roles in Season 2 included Dale Abrahams, Dorothy Ann Gould and Mac Manaka. Returning cast members included Warona Seane, Dan Robbertse, Nadine Naidoo, Neo Ntlatleng and Connie Mfuku. New main cast members for Season 2 included Mmabatho Montsho, Lindani Nkosi and Japan Mthembu. Leads returning to Season 3 included Connie Mfuku, Florence Mokgatsi, Neo Ntlatleng, Nadine Naidoo and Lindani Nkosi. New leads, among others included Vatiswa Ndara, Mothusi Magano, Sello Sebotsane and Atandwa Kani. The show was completely recast for Season 4, with Thembi Mtshali-Jones taking over the lead role of Dineo, now the President of the country. Other Season 4 leads include Terence Bridgett as manipulative backbencher Nathan Jantjies, Tshamano Sebe as Dineo's trusted advisor John Gumede and Precious Makgaretsa as community organiser Lerato Maduna. New cast members in Season 5 included Presley Chweneyagae as Chief of Staff Andile Grootboom, Warren Masemola as the Public Protector and Renate Stuurman as Press Secretary Shivane Nare. Returning to the show in Season 5 was Mothusi Magano, this time in a new role as the Secretary General of the ANC, Sello Tlhabanelo. He previously played the Julius Malema-inspired character Tshepo Sadiki in Season 3. 90 Plein Street, Cold Case and Erfsondes return to SABC2 for new seasons soon. Also coming up in November: a new gospel show Gospel Classics.